As predicted, the strongest cold front so far this season is moving south through the Midwest, and will arrive in the Birmingham/Atlanta areas this evening. 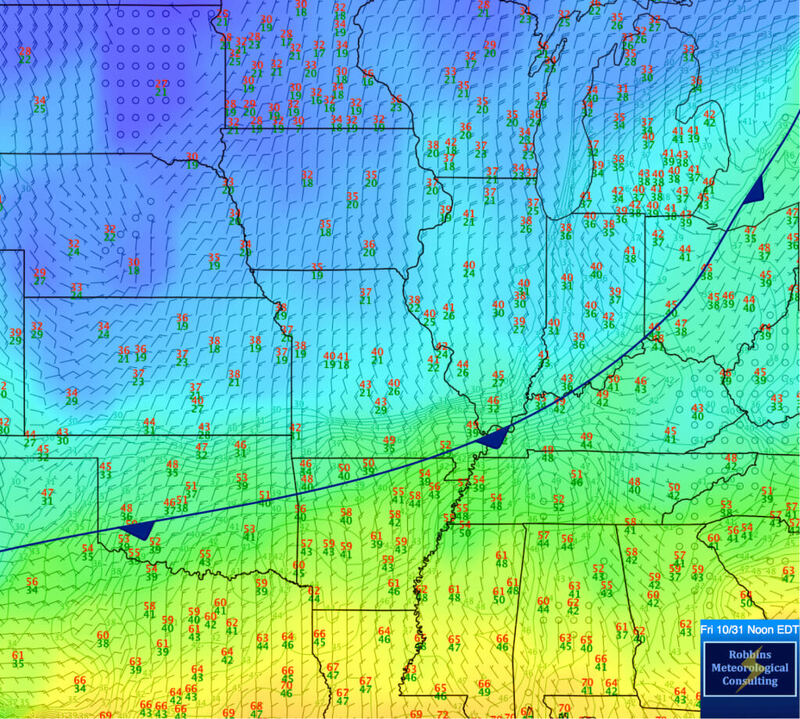 Partial analysis showing the position of the Arctic front at noon (October 31/14). Wind chill at noon EDT (October 31, 2014). The cold front will be moving through around 7 pm. Temperatures will fall into the 40s, especially after 8 pm. The wind will increase to 20-30 mph, gusting to 40 mph through the evening. There will also be some showers with the front this evening. I don’t expect widespread heavy rain, but there will be some showers. Temperatures will fall rapidly overnight, into the lower 30s by sunrise. 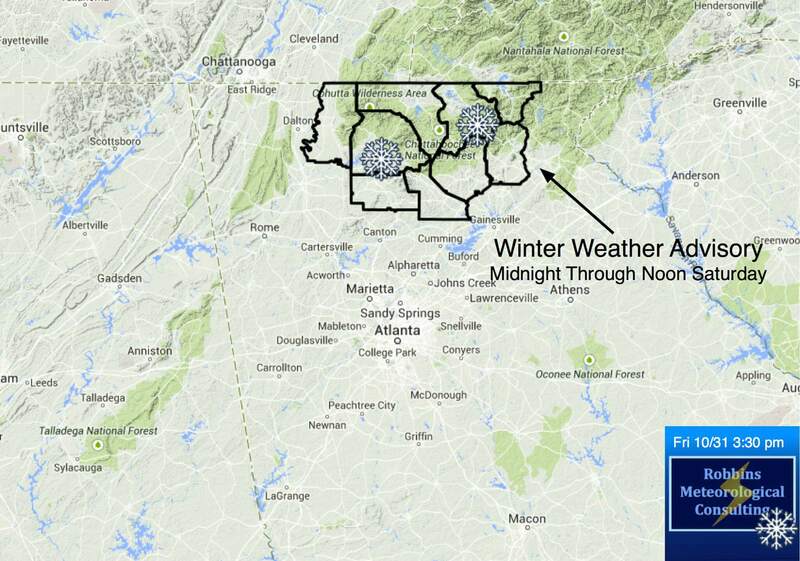 Light snow is possible north of a Cartersville to Gainesville line tomorrow morning. Wind chill tomorrow morning will be in the teens. High tomorrow (Saturday) in the mid 40s (a few locations may stay in the lower 40s). Lows tomorrow night (Saturday night) in the 20s. Winter Weather Advisory for snow has been issued for extreme northern Georgia. This map shows the counties that are now under a Winter Weather Advisory, effective tonight at midnight through noon tomorrow. Also, a Freeze Watch has been issued for tomorrow night (Saturday night) for all of northern and central Georgia. I fully expect this to be upgraded to a Freeze Warning by tomorrow. 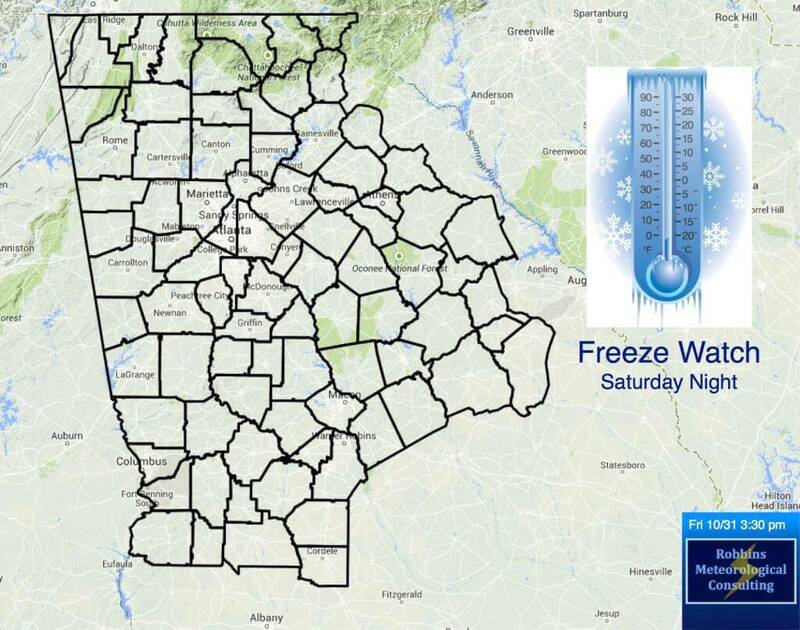 Freeze Watch for all of northern and central Georgia for Saturday night (11/1/14 through 11/2/14 at 9 am EST). Here is my partial analysis using 5 pm EDT data. At 5 pm, the front had just moved through Huntsville, AL. By 6 pm, the front had already passed Rome, GA. The front will enter the northwestern parts of the metro within the next hour or two (by 8 pm), with increasing wind and falling temperatures. 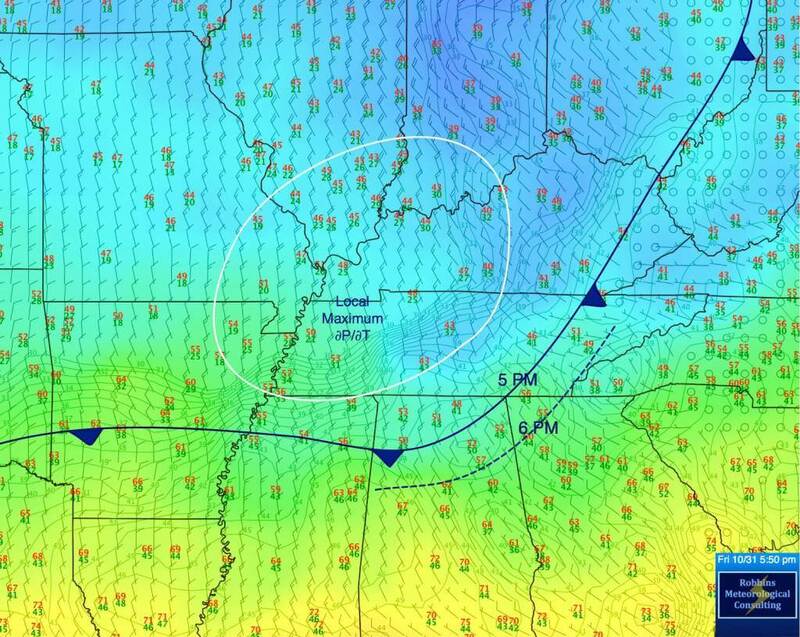 Just for folks who are interested in weather, I encircled an area where there is a local maximum in surface pressure rises (pressure tendency), which has resulted in a southward acceleration of the cold front into AL/GA. Partial analysis using 5 pm EDT data (10/31/14). Right on schedule… the cold front is entering the Atlanta metro… and currently extends from Alpharetta to Douglasville to Carrollton. The temperature in Carroll County is already falling into the 40s. Villa Rica is reporting 49º. Hartsfield-Jackson is reporting wind gusts to 35 mph behind the front. A few stations are close to 40 mph, including Rome. Temperatures will continue to plummet, into the 30s before sunrise. 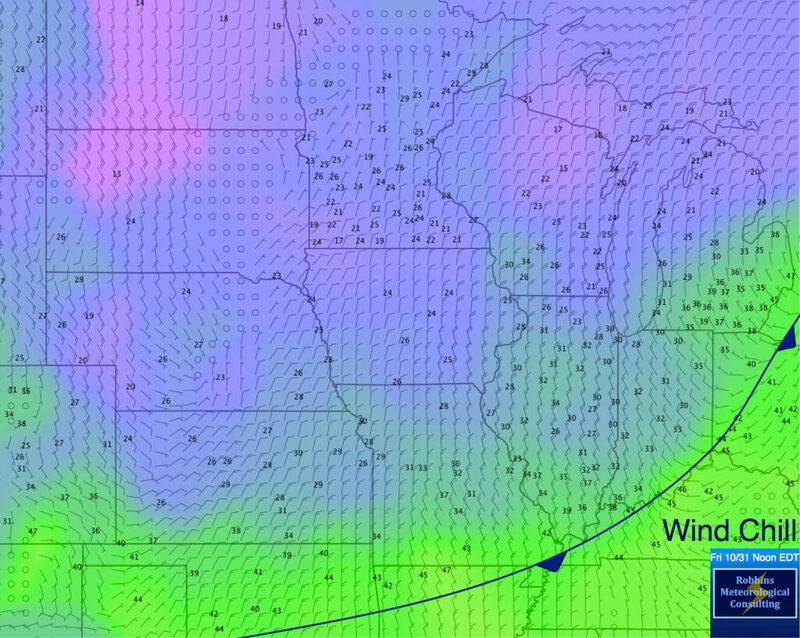 Do not be surprised if you see a few snow flurries flying in the wind tomorrow morning. I do not expect temperatures tomorrow afternoon to rise above 45º. If you are traveling northeast of Gainesville tomorrow, into the mountains, check road conditions before you leave. Current temperatures as of 10:30 pm EDT. 10:30 pm Temperatures (10/31/14). 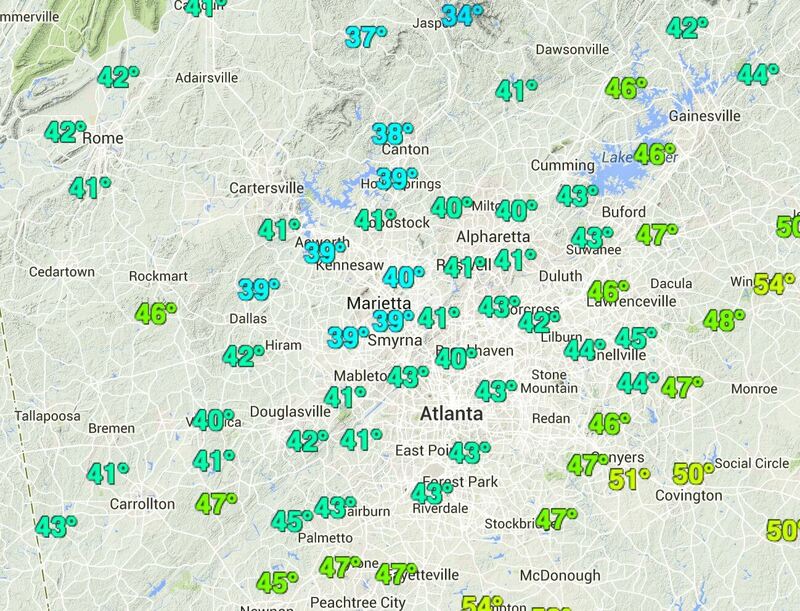 The cold front has cleared the entire Atlanta metro.